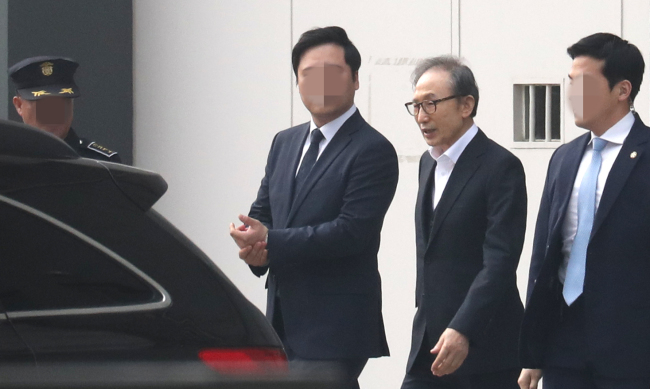 Former President Lee Myung-bak was released on bail Wednesday after almost one year of detention on corruption charges. Lee, president from 2008-2013, was sentenced by a lower court in October to 15 years in prison on conviction of bribery and embezzlement. He appealed the decision. The Seoul High Court approved the bail request that Lee made on Jan. 29 on the grounds of deteriorating health and other reasons. For the 1 billion won ($886,130) bail, the court ordered him to stay in his registered residence and meet or communicate only with his immediate family members and legal representatives. Lee accepted the conditions. Lee also requires court approval for hospital visits and must report his return to the court. Submission of logs on daily activities is also part of the requirements. Lee left the Seoul Eastern Detention Center and returned to his home in Nonhyeon, southern Seoul, at about 4:00 p.m. The court said that Lee's failing health had little to do with the decision. Placing him under house arrest before his arrest warrant expires will reduce the risk of him tampering with evidence and negatively affecting the trial, the court said. He was arrested on March 22 and was set to be released on April 8 unless the appeals court delivered a ruling by that day. "The conditional release will serve to maintain the effect of the arrest warrant and the defendant will be remanded in custody in case of any infraction," the court said. In the courtroom, Lee smiled faintly as the court read out its decision. "I fully understand (the conditions) ... I never approached the witnesses even before the arrest. I draw a strict line between private and public matters," Lee said. Following the court decision, he shook hands with his supporters in the courtroom. "The rough part begins now," Lee told the supporters. On Oct. 5 the lower court sentenced him to 15 years in prison.